"Don't you see the rage burning from within me?" 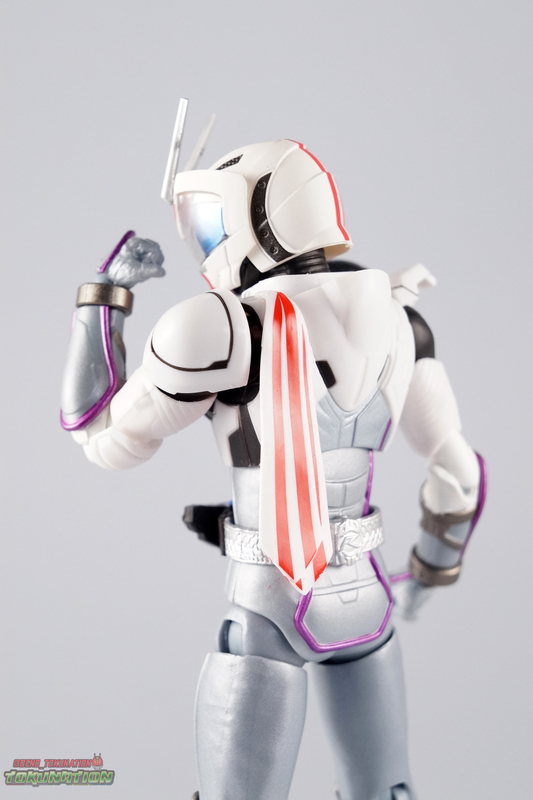 Kamen Rider Drive has been over for nearly a year now, and yet releases for the series persist, thankfully so! As a big fan of the show I've been very pleased with each addition I can make to my Drive display. Today's subject is yet another new and welcome addition. 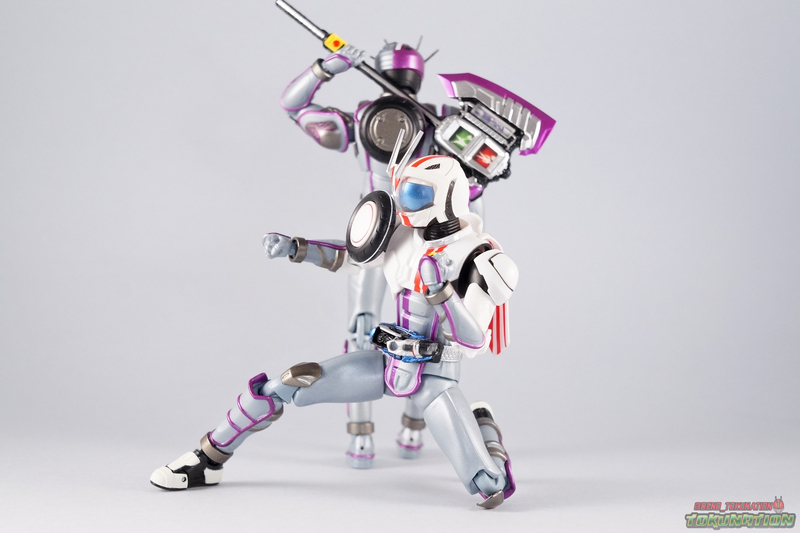 A last ditch combination used to defeat Gou's father, Gold Drive, the power of Chaser & Mach are united in S.H. 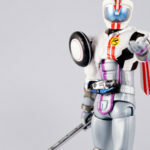 Figuarts Kamen Rider Chaser Mach! Business as usual once again. We've seen this nearly identical style of box several times over in this line. Links to previous galleries for reference. Now this review will kind of be a double rehash. 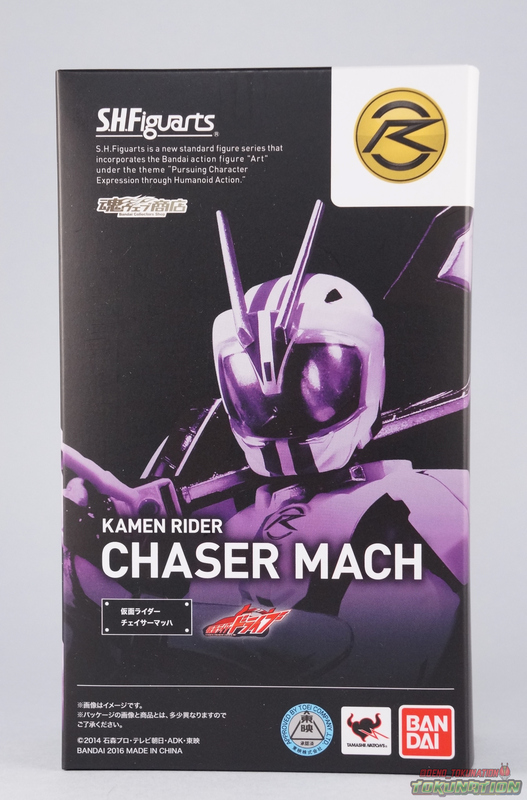 Chaser Mach is almost part for part a straight up reuse of most of the lower half of S.H. 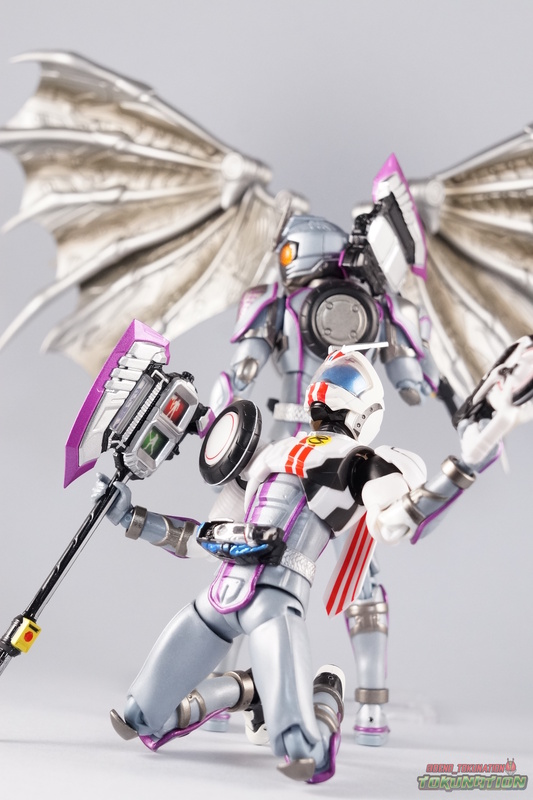 Figuarts Chaser, and the upper half of S.H. 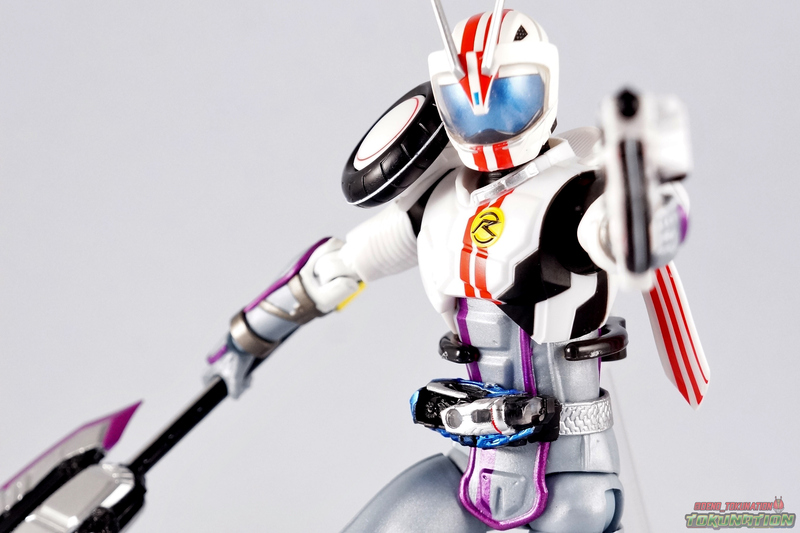 Figuarts Mach. Feel free if you like to enjoy over 70 glorious pictures below if you'd rather skip ahead. 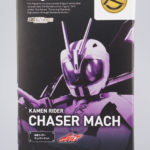 For the lower half of Chaser Mach we're looking almost strictly at Chaser components. From the mid torso down to the ankles. The feet are however Machs. The nice thing about less bulky and more acrobatic suits like this one is they just don't have all that bulk to get in their way. 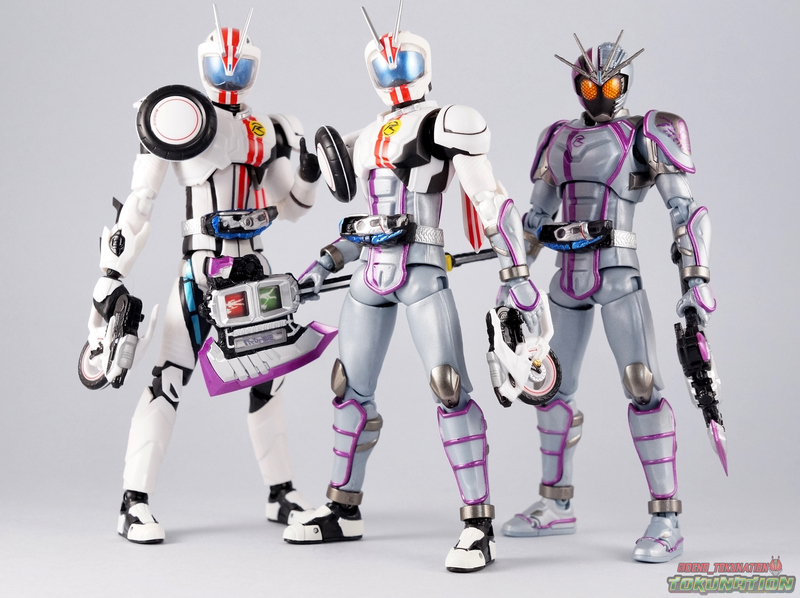 Much like Drive, the Chaser legs have fully unrestricted hips. However I do need to mention that because of the sort of safety pad design of the shin armor the feet cant quite tilt back as far as I'd like. The Chaser half of the body of course includes a Mach Driver with Signal Chaser preset in it. Not much in the way of painted details on the Signal Chaser but at that scale it gets the job done. Where this lower half of the torso meets the Mach chest above it I wish that joint had more range, but you can still manage to get some decent poses out of him. He just can't hunch over or arch his back the way I'd like. 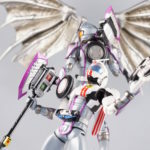 Now the upper torso is just the Mach chest sat down on Chasers' body. The standard Signa Advent affixed to his shoulder pad is present. You can still exchange it for the other advents made for Mach from the S.H. 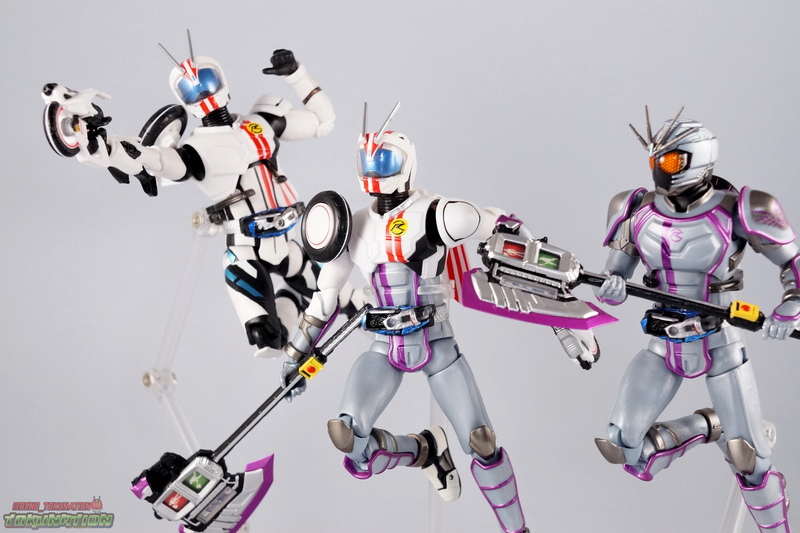 Figuarts line, but Chaser Mach was never shown to use any of them. 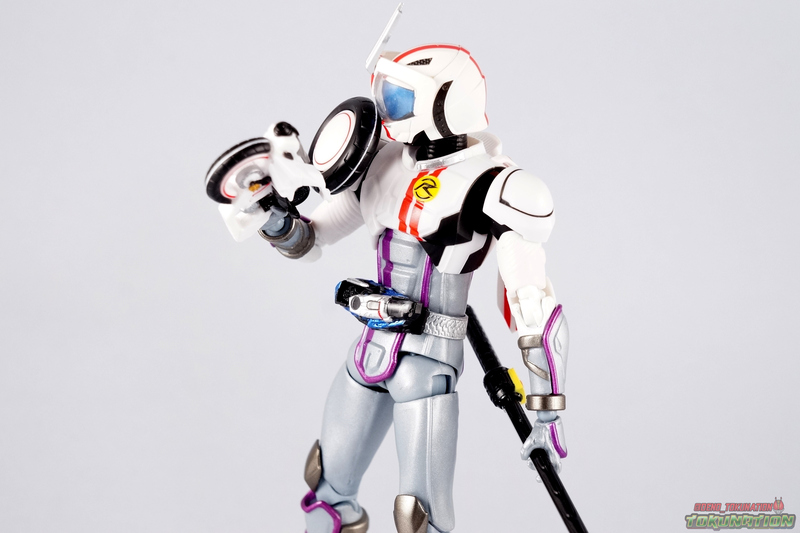 Thankfully this version of mold also uses Mach's hands and upper arms, but the forearms are Chasers padded armor. 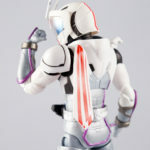 So that funky armor on Mach's normal right arm isn't present to get in the way. You just get a nice streamlined look for him. 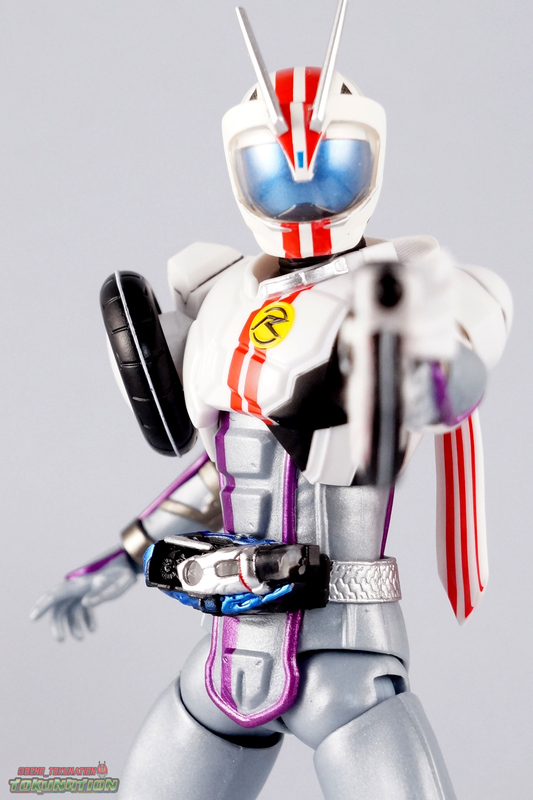 As with the original release, Mach's V-Helm can be opened to reveal his Shutter Face Guard beneath as well. The combination of these two figures winds up working perfectly. They integrate seamlessly in a way that makes this design looks pretty much perfect. As though it was always intended rather than a last minute addition. Chaser & Mach's colors and designs compliment each other well in this shared figure. As a side note you'll notice below I took some shots with Mashin Chasers' Busou Chaser Set. This figure is NOT compatible with those parts, I was merely trying to recreate the scene from episode 46 when the Viral Cores save Gou. 2 - sets of additional hands. That includes 2 identical open palm expressive hands, and 2 holding things hands. These are repacks of exactly the hands that came with Chaser. 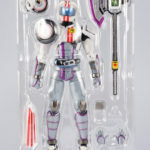 1 - Shingou Axe (Signal Axe). 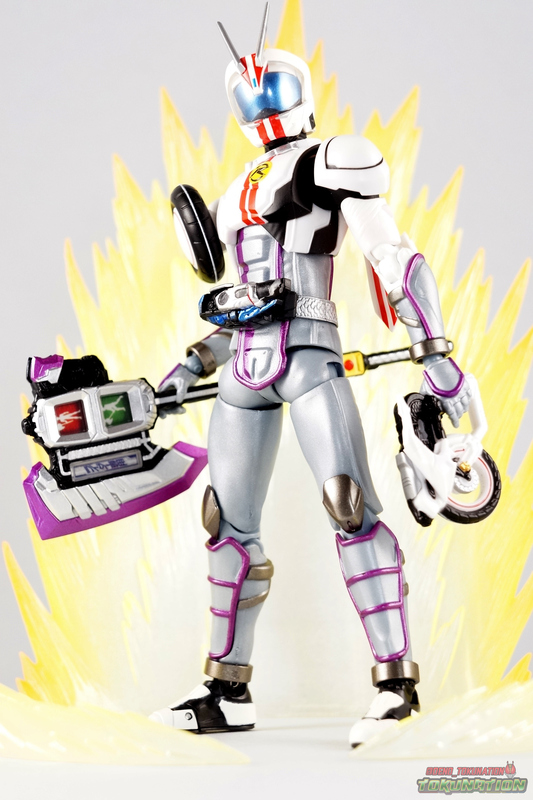 Chaser's signature weapon and all around fun plot device for battles. 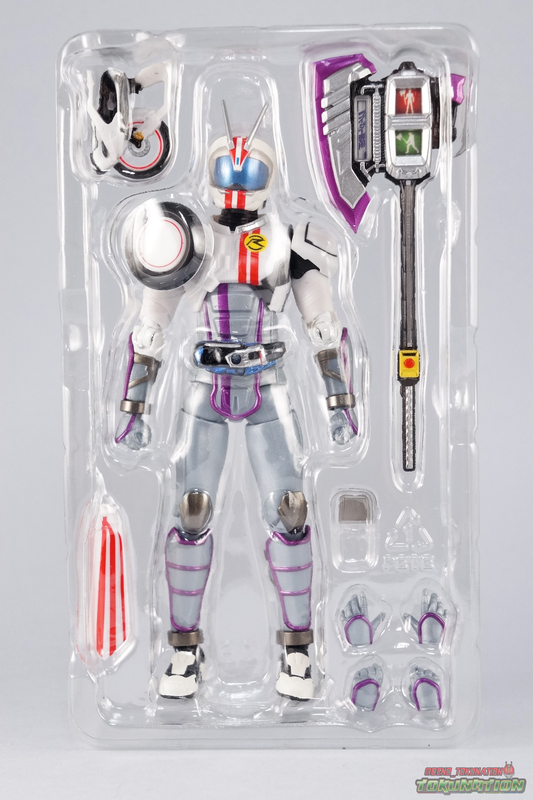 This is a repack of the one that came with Kamen Rider Chaser. 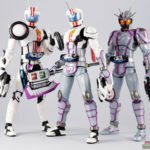 It can accept Signal Bikes like the one included in Chaser's Mach Driver thanks to a small port adjacent to the signals. My 2 gripes with the ax however are that the silver paint used on the handle rubs off very easily, and that the signals themselves are labels. 1 - signal effect part. A replacement window for the E-Condition Lamp that signifies the change from the "wait" & "go ahead" signals during a Full Throttle attack. This piece replaces the clear plastic window on the ax with one darkened half that can be used over either signal. It's a really a nice piece to have included. 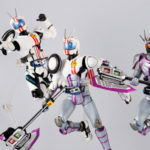 Though removing the faceplate on the ax can be dicey at times. Again this is a repack from Chaser. 1 - muffler/scarf. Sadly only the standard "resting" one is repacked from the original mach release. You don't get the more dynamic windblown one in this set. 1 - Zenrin Shooter. Another straight repack from the original Mach. As with the Driver & Ax it can accept Shift Bikes via a small tab and clip system on the side. Other than that it's not really functional though, no spinning tire or anything like that. All in all not bad, but considering the obvious and extensive reuse and repacking of parts I don't quite understand why Chaser Mach didn't come with more hands or scarves at least. If you haven't guessed it by now, S.H. 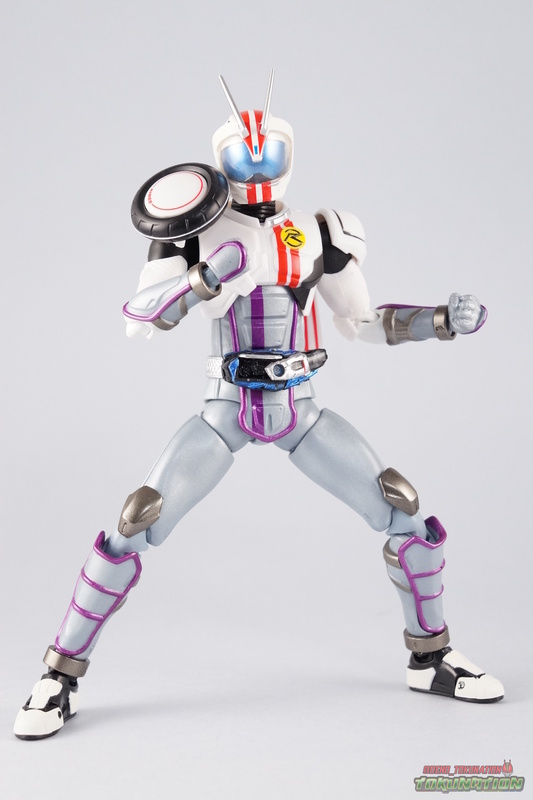 Figuarts Kamen Rider Chaser Mach is yet another winning addition to the Kamen Rider Drive lineup. 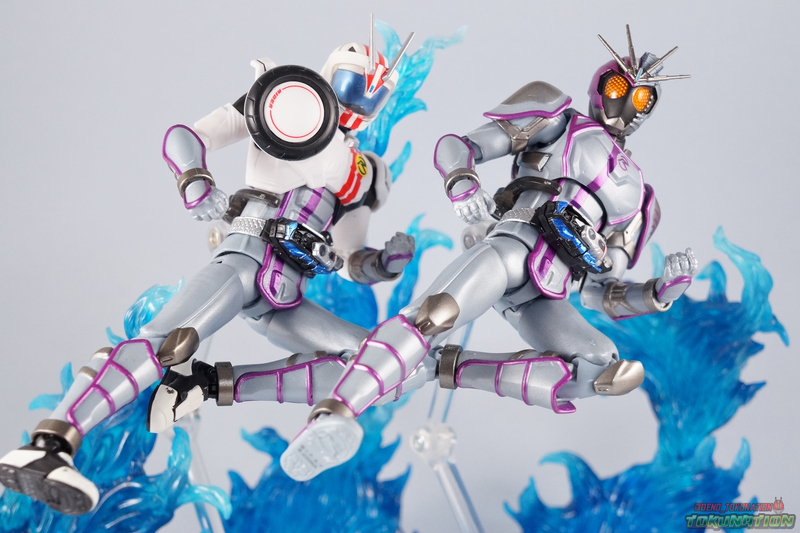 Taking 2 fantastic figures, one of which is one of my favorites in the entire line (Chaser), and cramming the best parts together is a perfect formula for success in my opinion. 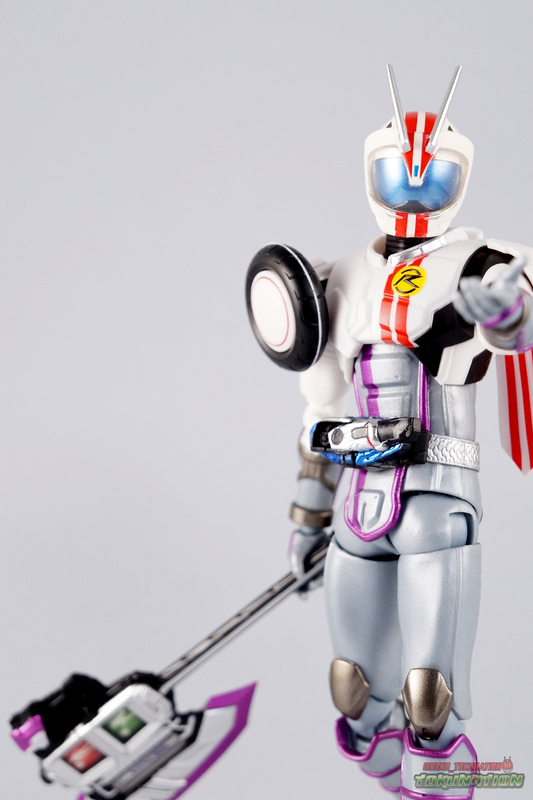 This show is well known for suit and parts reuse and I love that the toyline continues to embrace it. 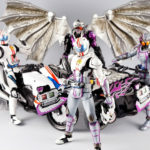 With upcoming releases like Gold Drive & Zero Drive, I can only hope this subline continues until we get all of the Drive riders and forms. Good job on the gallery, as always! I have trouble separating the quality of the figure from the laziness of the suit on which it's based. 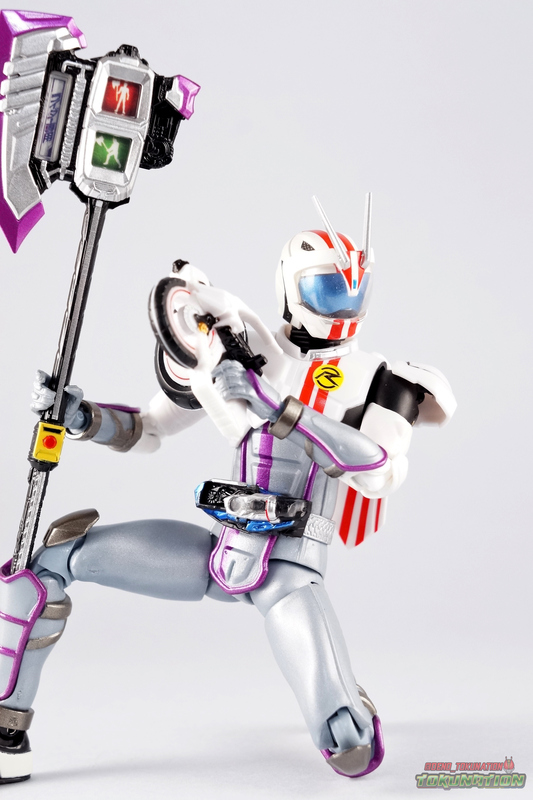 Also, I suppose, separating the suit's laziness from how it reflects the strongest stretch of Drive episodes. 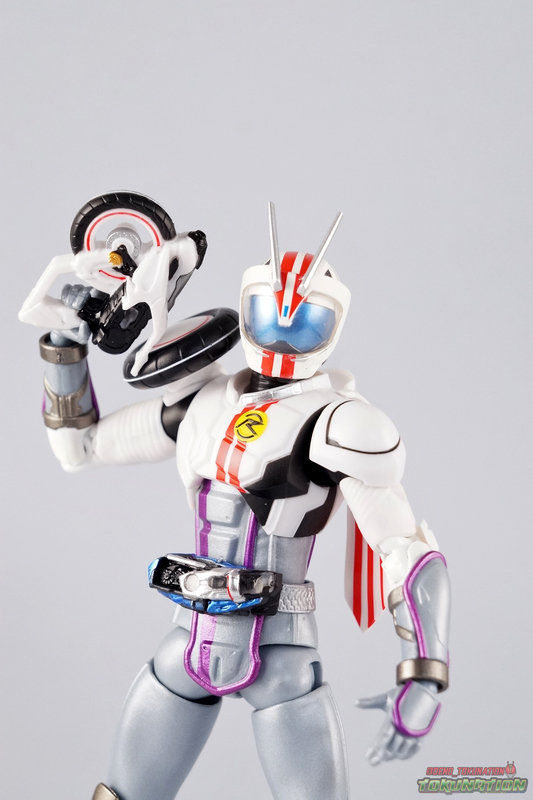 Gou had gone from being my least favorite character on Drive to being the most interesting. 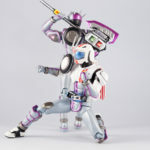 I can only hope that Ex-Aid won't suffer Drive suit-budget woes. 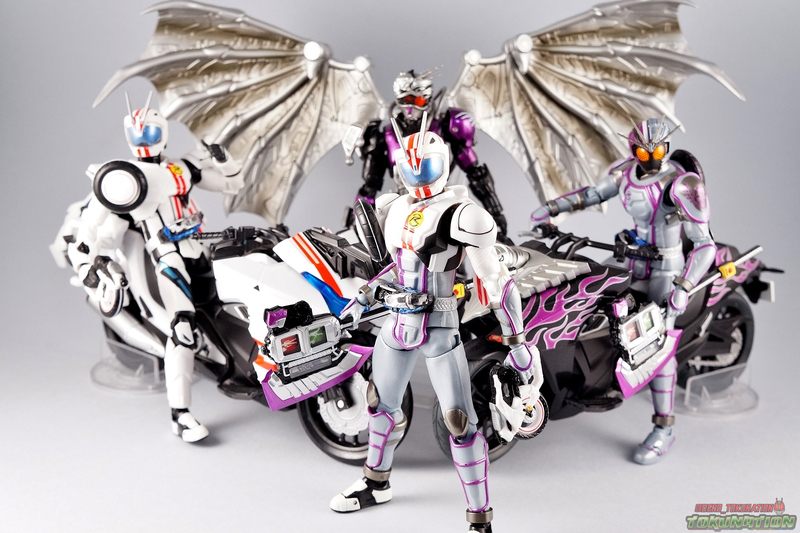 Mach never got a proper upgrade, since he shared Dead Heat with Drive and this form with Chaser. I'll always wonder what a real Mach upgrade would've looked like. 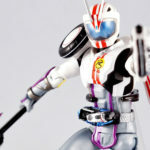 Well even his V-Cinema form is just another repaint of what amounts to his basic suit. But that's okay by me. The suit reuse is kind of what I find most charming about that franchise. They had very little to work with after the extravagant Roidmude budget and Drive's multiple forms, but they made it work all the same. It's a neat custom, but ultimately that's all it is. I quite like what they've done with Mach in the actual show & movies.